Discussion in 'Music Corner' started by George P, Oct 3, 2014. This thread (and the 60 that have preceded it) is for all things that relate to Classical Music. Feel free to post what you're listening to, recordings you recommend, recent classical purchases, classical concerts, classical works, classical composers or classical performers. Discussion topic from the prior thread - what are some of your favorite classical guitar CDs? Any comments on Daniele Gatti becoming chief conductor of the Royal Concertgebouw Orchestra in 2016? Probably my favorites as music are Segovia's EMI recordings from the 20's and 30's. Not to negate the work of John Williams, Julian Bream, the Romeros , Los Angeles Guitar Quartet and others but there is something haunting about Segovia's earliest records, a window to a different time. 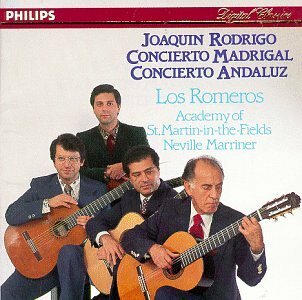 I can hardly believe how many LPs—really good LPs—of the Concierto de Aranjuez by Joaquín Rodrigo entered my collection this year. There's Alexandre Lagoya on Philips, the Romeros on Mercury on a Philips Netherlands pressings and Narciso Yepes on an old London pressing with Argenta directing the Spanish National Orchestra, probably my favorite of a very good batch. I don't know if I posted this before but here is something that doesn't come around very often. If you are in the bay area around mid January this might be something to see. i am planning to go. If you would like assistance purchasing tickets for patrons with disabilities, please call the box office at (415) 864-6000. Just posting to be able to find this thread easier later. I haven't listened to much classical recently. My first impression is that these are excellent performances but I would like to hear more passion and emotion in the playing. The technique of both Kavakos and Wang is supreme but the interpretation seems to me a bit cold. In any case, this is definitely worthy of checking out if you like Brahms (and you should, if you are into romanticism in music it does not get any better than Brahms IMO). Dan C, bluemooze and Scott Wheeler like this. Actually, I meant, the choice was interesting. There were few "bigger names", I guess, so I was wondering if there was any risk. On the other hand, it just demonstrates good, self-confident, perhaps even enterprising spirit on the part of those who did the decision. I have no idea what to expect, I'm not familiar with Gatti's work so far, that's one reason I was asking for comments. It's indeed an interesting choice. Gatti is the second Italian chief conductor of the RCO after Riccardo Chailly and in my view Chailly proved to be a pretty good choice, though his work is not to everyone's taste. Now trying to listen to Schubert's Fourth played by Kölner RSO cond. by G. Wand. Even though the orchestra sure is better than mediocre one, I've got tired of their sound couple of times. For example this cd no. 19 is recorded sometime in 1980-81 - I don't know whether it's already early digital recording or not - but had recently a digital hires remastering. Yet there's now and then such a tense (tight? strained?) sonic quality that I contemplate to swap the source... Or, it could also be the case that my ears are just too tired. On the other hand, I like the stereo image, the clarity, the separation of the instument groups etc. : it's easy to follow the music, even if the listening is sometimes slightly tiresome. bluemooze and Robin L like this. Well, my opinion doesn't matter but I've thought him to be among the leading conductors of his generation. I meant Chailly, of course. Gustave Holst - The Planets, any version. You know, it's hardly the most "profound" work out there, and I don't think it would hold up well in "heavy rotation" playback, but for sheer joi de vivre (apologies to our Francophone friends for what I probably just did to their lovely language) I'd be hard pressed to name anything better than Rodrigo's Concierto de Andaluz for four guitars and orchestra, at least as played by the dedicatee Romeros on its original Mercury release. Robin L, john greenwood and dale 88 like this. I only have two discs by Gatti - Debussy and Tchaikovsky. However I do like them so I will be watching for his work with the Concertgebouw. If we can include lute, I have four of the Hopkinson Smith discs on Astree. On guitar, the first that comes to mind is Goren Sollscher's work. I have his Bach recordings as well as his disc of Renaissance music transcriptions. I like Narciso Yepes disc of Scarlatti transcriptions. Parkening Plays Bach is neither the best sounding guitar recording I own, nor the most profound recital, but it was my first (on LP) and it remains some of my favorite "comfort music." 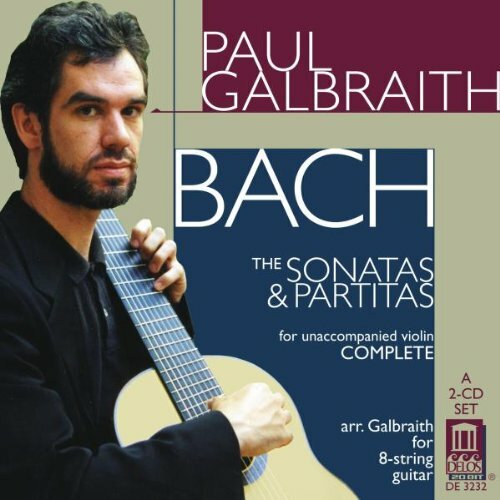 I love Paul Galbraith's transcriptions of Bach's solo Violin Sonatas and Partitas. He uses an 8-string guitar--one extra bass and treble string, which greatly increases his expressive range. I like Eliot Fisk a lot, but his recordings never sound too good. He often sacrifices beautiful tone for drama, which doesn't always work that well under the scrutiny of microphones. Jorge Caballero, David Russell, and Julian Bream would be safe recommendations, though. bluemooze, vanhooserd, Robin L and 1 other person like this. 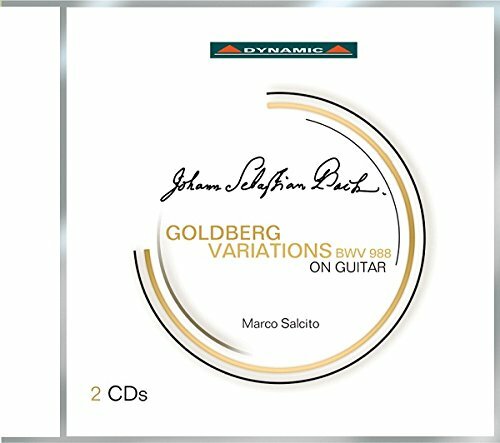 I recently got a CD with Kurt Rodarmer playing The Goldberg Variations on guitar. Listened to it for the first time yesterday. Fascinating transcription. He uses two different custom designed guitars and recorded the parts separately and mixed them. Not something that would be possible to play live like that. Mik, bluemooze, Robin L and 1 other person like this. And I just got this transcription. This one is on a single guitar, although there is a price to be paid in tempo. The transcription took 3 years. Mik, Robin L and Bachtoven like this. That reminds e of a lovely Lagoya/Presti disc I need to add to my list. It was part of an early Philips budget CD line. I was listening to this the other day. I've mentioned before in these threads that in the late sixties I was fortunate enough to attend a pre-concert party with the Romeros in Atlanta where they were to perform with the symphony the next night. A string quartet from the symphony played, both Pepe and Angel Romero dashed off a couple of impressive etudes, and finally all four Romeros played a movement from one of the Beethoven Op.18 quartets they had transcribed for guitars. All this for about 20 people in my friend's apartment. It was a memorable evening, to be sure. Mik, Soulpope, bluemooze and 3 others like this. Probably my favorites as music are Segovia's EMI recordings from the 20's and 30's. Not to negate the work of John Williams, Julian Bream, the Romeros , Los Angeles Guitar Quartet and others but there is something haunting about Segovia's earliest records, a window to a different time. Let me guess, for CD Pearl and Biddulph are the way to go? I just want to say thanks for the many great responses to my guitar query. I hadn't thought of directing the discussion of this thread, but now I'm thinking that it would be great to do this with other genres/topics in the future. I also want to encourage any of you to do the same. I have that disc, too. While the tempos are often considerably slower than a typical keyboardist would use, sometimes the actual musical lines emerge more clearly. I think he could use a bit more variety of tonal and dynamic shadings, but part of that is a limitation of the construction techniques used to make his guitar: the builder uses a lattice bracing pattern, which increased the overall volume and clarity compared to a traditional fan style bracing, but it also reduces the range of tone colors.